Are you missing a tooth — or maybe even a few teeth in a row? 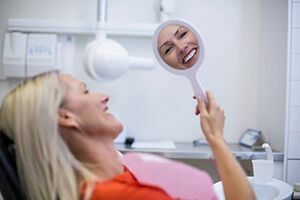 A fixed dental bridge in Newington is a restorative service that may be able to fill in that embarrassing gap, boost your confidence, and support your oral health. As its name implies, this treatment “bridges” the gap between teeth. There are a few different types of bridges, but the most common type has three distinct parts: two crowns, which are placed on top of the teeth that are adjacent to the gap, and a pontic (artificial tooth) that fills in the empty space. 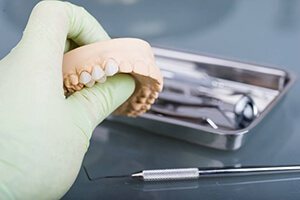 Some patients are candidates for an implant-supported bridge, which is secured in the mouth via small titanium posts that are inserted into the jawbone rather than by your natural teeth. For many years, metals (such as gold and silver) were the most popular material for bridges. While they’re very strong and can last for decades, many people dislike them because they look nothing like natural teeth. 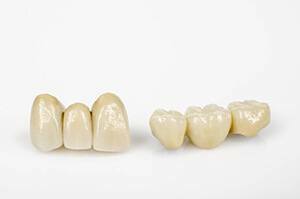 Porcelain is often the best material for bridges because it blends in seamlessly with the teeth around it. It is also very strong and resistant to stains. First, we prepare the abutment teeth (the teeth that will receive the crowns). Your dentist in Newington may have to file them down a bit or fill them in so they will fit under the crowns and provide adequate support. We take some impressions of your mouth. They serve as the basis for creating a custom crown that provides you with a comfortable and strong bite. You wear a temporary bridge to protect your teeth while a laboratory creates your permanent restoration. Once your permanent bridge is ready, we adjust its fit and cement it to the abutment teeth. After you lose a tooth, the adjacent teeth may begin to drift out of place and cause you to have a misaligned bite. A bridge serves as a placeholder that stops the drifting. Your bridge should feel very comfortable; you might even forget that it’s there! Bridges are quite strong, so you’ll be able to enjoy most of your favorite foods without worry. A traditional bridge can last for a decade or longer with proper care. An implant-supported bridge even has the potential to last a lifetime. Caring for a bridge is simple. You’ll need to floss underneath the pontic, but that is the only significant change to your oral hygiene routine that you’ll have to make. Your dental insurance may be willing to cover a significant portion of the cost of your treatment. To discover whether a dental bridge is a fitting treatment for your circumstances, contact us to schedule a consultation.